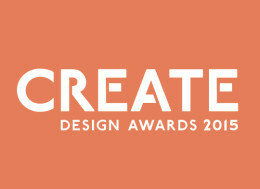 At desktop and The Create Design Awards, we strongly believe in grounding our awards program with a judging process that is respectful, thorough and inclusive. We also believe in transparency. And so we’d like to take a moment to share the process that led to the selection of the 2015 Create Awards shortlists, and the winners, who will be announced at the gala party on 29 October. This year, we developed a new process to support the award’s values. Our panel of jurors was carefully selected to reflect a balance in genders, ages, fields of relevant expertise and experience. Above all, our jurors were selected for their proven leadership and excellence, and their support and enthusiasm for our design community. And so we landed with Sam Davy, Eva Dijkstra, Adam Ferrier, Linda Jukic, Jack Mussett and Beci Orpin. The first stage of adjudication was shortlisting. Each juror viewed and considered each project in each category, and put forward their nominations for shortlisting, according to the projects deemed to be strongest, looking out for the quality of the idea, the quality of the execution and the success when combining these two elements. A project needed to receive a nomination from 50% of the jury panel in order to make the shortlist. We then took these category shortlists into two live jury days, where each shortlisted project was defended, championed and closely scrutinised. First, the Melbourne panel collaboratively selected a ‘top three’ for each category, which were then confirmed or added to in special cases by the Sydney panel. The top three, and in special cases, top four projects in each category then moved to a final scoring round, wherein each juror scored each project with a 1 – 5 ranking against four criteria. The criteria altered slightly according to category, but generally followed 1) Instinctive Reaction and Emotional Response, 2) Idea, 3) Execution and 4) Relevance. All juror’s points were tallied, and the highest scoring project in each category project will be the ones declared winners on October 29. The next two highest scoring projects will be awarded as category finalists. The Project of the Year will go to the project awarded the highest number of points from all jurors across all categories. And so, which projects will take the cake this year? Join us on 29 October to toast the winners.